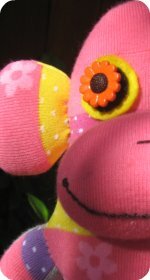 Find fun puppet kits with easy to follow sock puppet pattern and materials. Learn how to make puppets for kids. 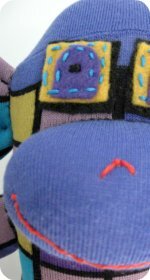 You'll have fun making them and even more fun putting on a sock puppet show. If you'd prefer just to get a ready made sock monkey puppet there are a few to choose from. Don't forget the puppet theater, otherwise just jump behind the couch and put on a show. 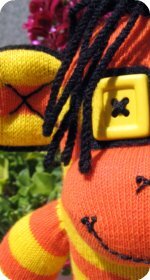 There are a few of different sock puppet kits available or you can just use your imagination and knock up a basic sock puppet. Creativity for Kids My First Sock Puppets is a kit for pre-schoolers. 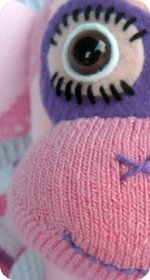 It contains three socks and loads of accessories to put on the socks to transform them into fun puppets. Striped Sock Puppets Kit gives you four stripy socks, eyes, pom-poms, ears, noses and other felt pieces. You can make a cheap homemade puppet with no pattern at all. Kids love it even if you just grab a plain old sock (preferably clean - phew!) and even with nothing added to it, no fancy button eyes or anything, your away. Push part of it in to represent a mouth and start that little guy talking. If you want to be a little more creative create characters by sticking on felt or googly eyes, sewing on buttons or whatever else you might have handy. Use yarn for hair, you could have a piece of felt hanging out of it's mouth for a tongue. Puppets are really great when talking to kids. 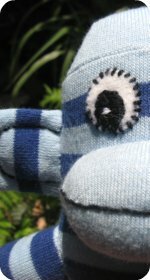 I find my boys where always happy talking to a puppet and where always surprisingly open and comfortable chatting to any of our sock puppets, especially if they had helped to create them. Sock Monkey kits are available if you'd prefer to buy a kit with everything you need to make a sock monkey. There are kits for other types of sock animals and creatures also. 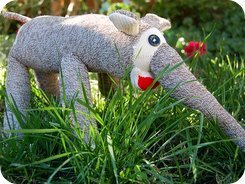 Don't forget the free sock monkey and elephant patterns which you can adjust to make your own special creature, there are no rules when it comes to crafting a sock pal. Below is the result of the first every sock elephant I attempted, yeap, it's a little weird.